Abl1 (phospho-Tyr412) antibody detects endogenous levels of Abl1 only when phosphorylated at tyrosine 412. Affinity-purified from rabbit antiserum by affinity-chromatography using epitope-specific phosphopeptide. The antibody against non-phosphopeptide was removed by chromatogramphy using non-phosphopeptide corresponding to the phosphorylation site. The antiserum was produced against synthesized phosphopeptide derived from human Abl1 around the phosphorylation site of tyrosine 412 (D-T-YP-T-A). Small volumes of anti-Abl1 antibody vial(s) may occasionally become entrapped in the seal of the product vial during shipment and storage. If necessary, briefly centrifuge the vial on a tabletop centrifuge to dislodge any liquid in the container`s cap. Certain products may require to ship with dry ice and additional dry ice fee may apply. 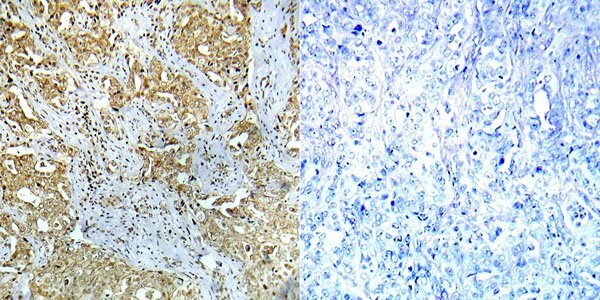 P-Peptide-+ Immunohistochemical analysis of paraffin-embedded human breast carcinoma tissue using Abl1 (phospho-Tyr412) antibody. Western blot analysis of extracts from COS7 cells treated with Adriamycin. Left: Using Abl1 (phospho-Tyr412) antibody. Right: Using the same antibody preincubated with synthesized peptide. NCBI/Uniprot data below describe general gene information for Abl1. It may not necessarily be applicable to this product. Wang J.Y. et al. (2000) Oncogene 19, 5643-5650. Danial N.N. et al. (2000) Oncogene 19, 2523-2531. Pluk H. et al. (2002) Cell 108, 247-259. Rikova K, et al. (2007) Cell 131, 1190-203. Goss VL, et al. (2006) Blood 107, 4888-97.